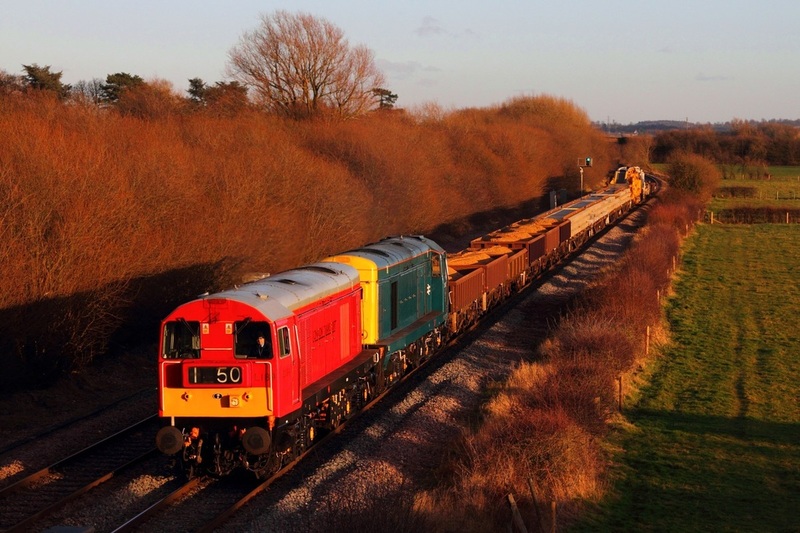 London Underground Red liveried 20189 leads Br Blue 20142 on the 6K50 Toton to Crewe Basford Hall engineers at Barrow upon Trent on the 7th February 2014. 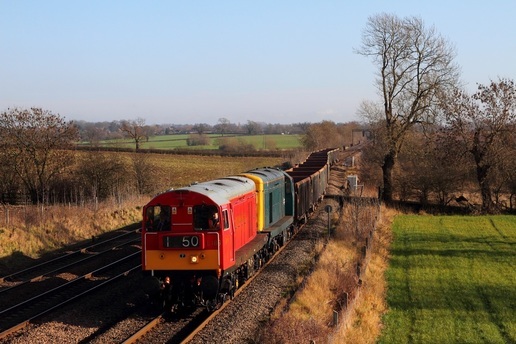 The use of the choppers enables a GBRF class '66' to be freed for the weekend engineering works. 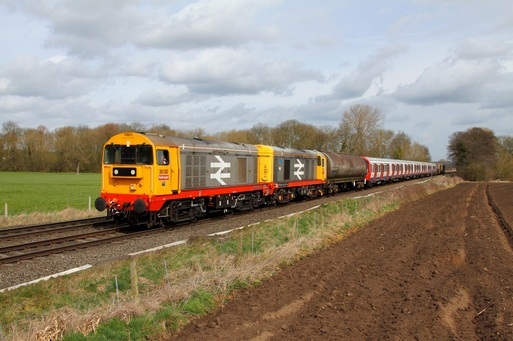 66709 had worked 6M73 from Doncaster. 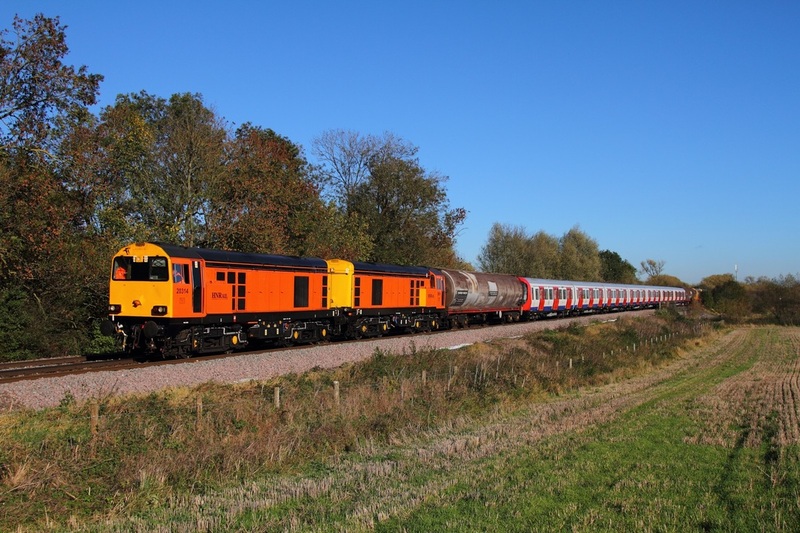 DRS 20308 leads 20312 on the 3S14 Grimsby to Manton at Hatfield and Stainforth on the 10th October 2014. 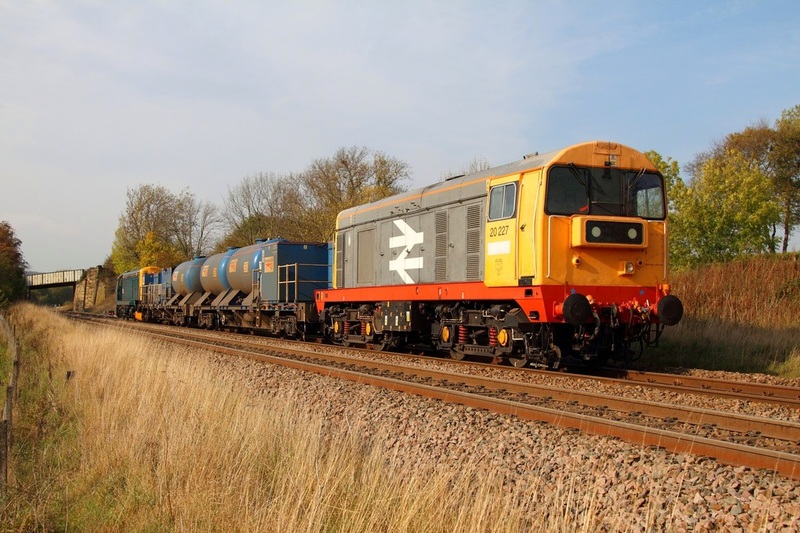 20308 lead 20305 on the 6K74 Sellafield to Crewe at Parton on the 1st August 2015. 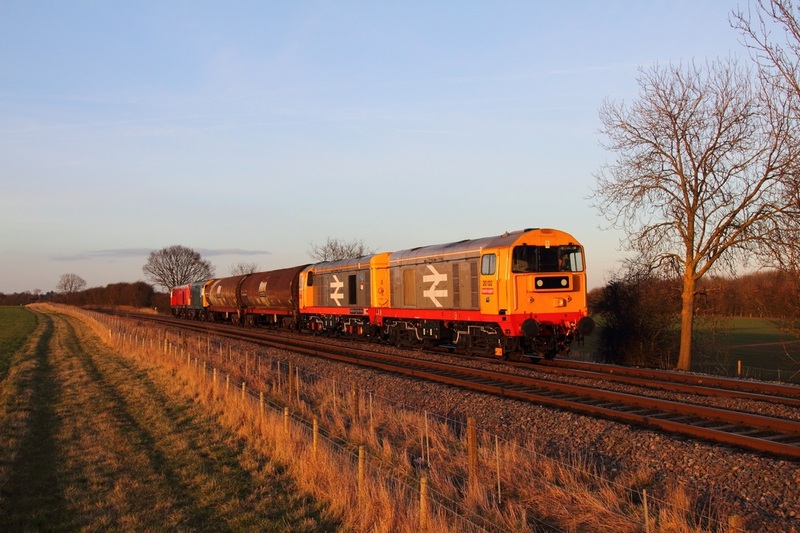 Railfreight 20132 leads 20118 tnt 20142, 20189 on the 6E21 Old Dalby to Peterborough at Langham on the 7th March 2014. London Transport liveried 20189 leads Br Blue 20142 on the 6D02 Wellingborough to Mountsorrel at Kilby bridge on the 22nd January 2013. 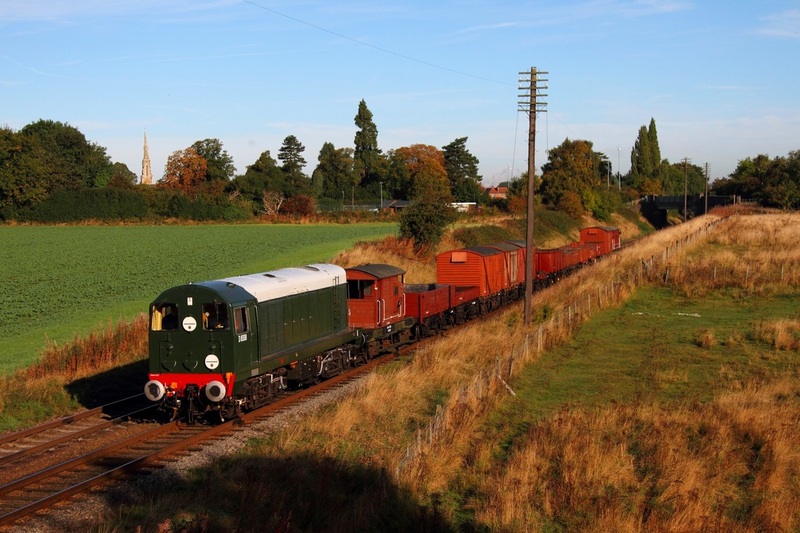 On the 4th November 2013, HNRC 20314 leads 20311 tnt 20118, 20096 on the 7X09 Old Dalby to Amersham at Frisby near Syston. Railfreight pair 20132 leads 20118 with 20107 and 20096 on the rear of the 7X09 Old Dalby to West Ruislip underground stock move at East Goscote on the 30th March 2015. 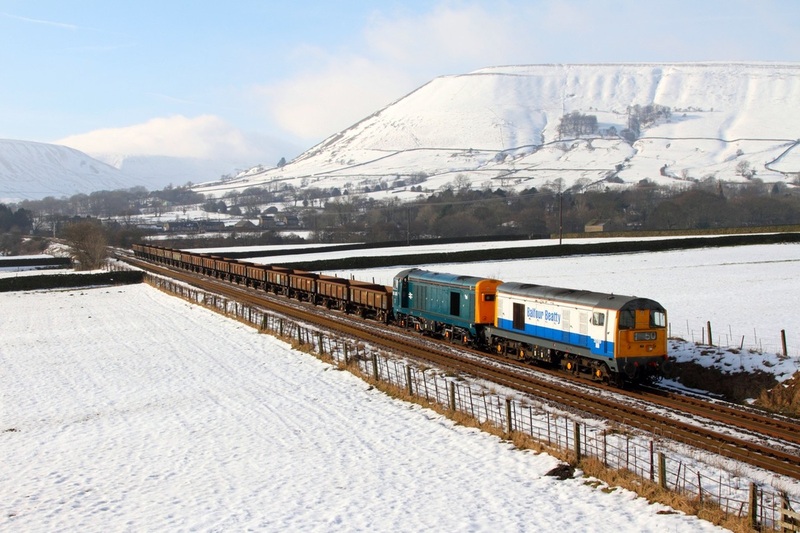 Balfour Beatty liveried 20189 leads Br Blue 20205 works the 6Z21 13:25 Peak Forest to Chaddesden sidings at Edale in the Hope Valley on the 7th February 2015. 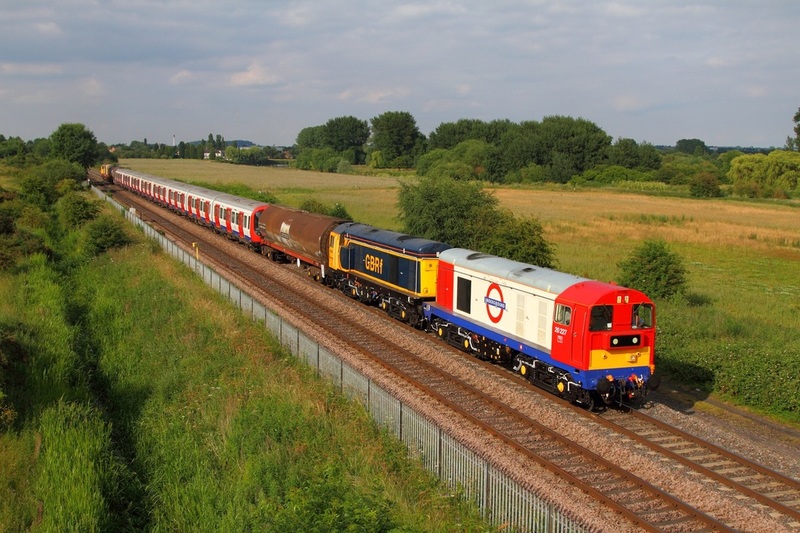 London Underground liveried 20227 leads 20905, 20132, 20118 on the 7X09 Derby Litchurch Lane to Old Dalby at Branston south of Burton upon Trent on the 24th June 2014. 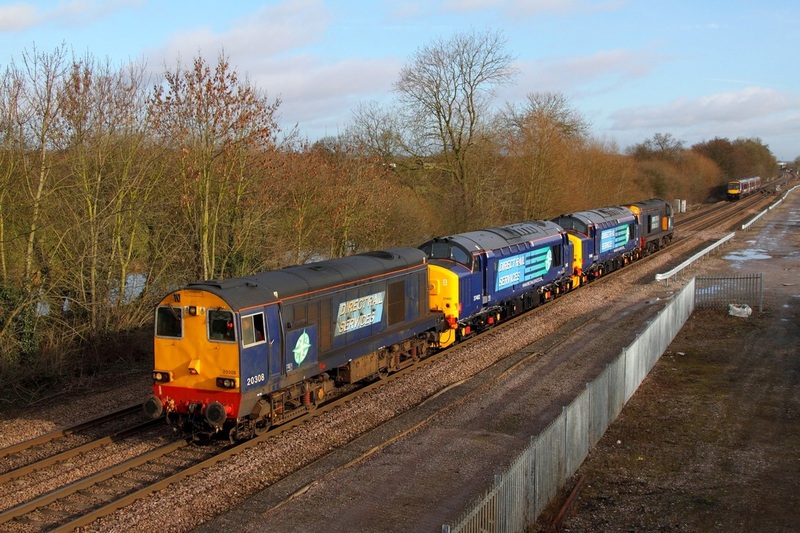 DRS 20308 and 20312 sandwich DRS 37402 and DRS 37405 (both of which have received extensive overhauls and repaints at Barrow Hill depot) on the 0Z57 Barrow Hill to Crewe Gresty Bridge at Stenson junction on the approach to North Staffs junction on the 1st February 2013. 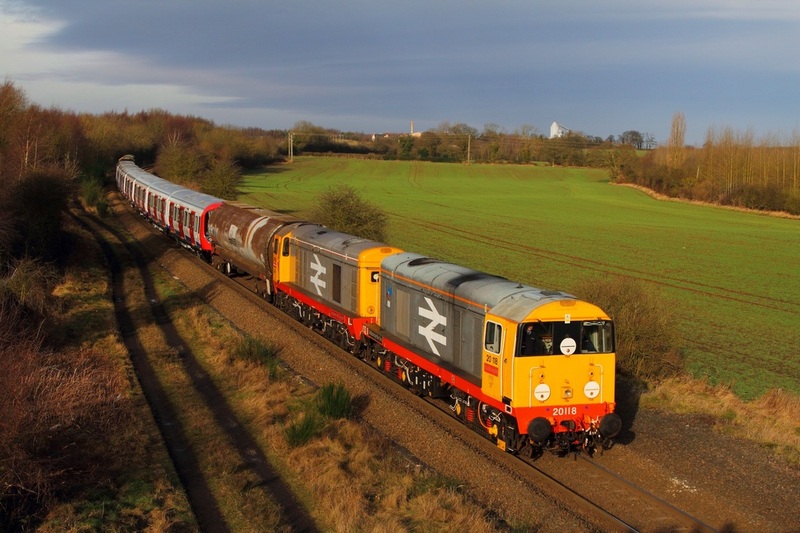 37402 and 37405 both former DB Schenker locos are set to be reinstated shortly after final checks and tests at Crewe Gresty Bridge. Unfortunately the future for 37401 and 37411 remains uncertain with 37422 presumably being readied at Kingmoor for a return to traffic. 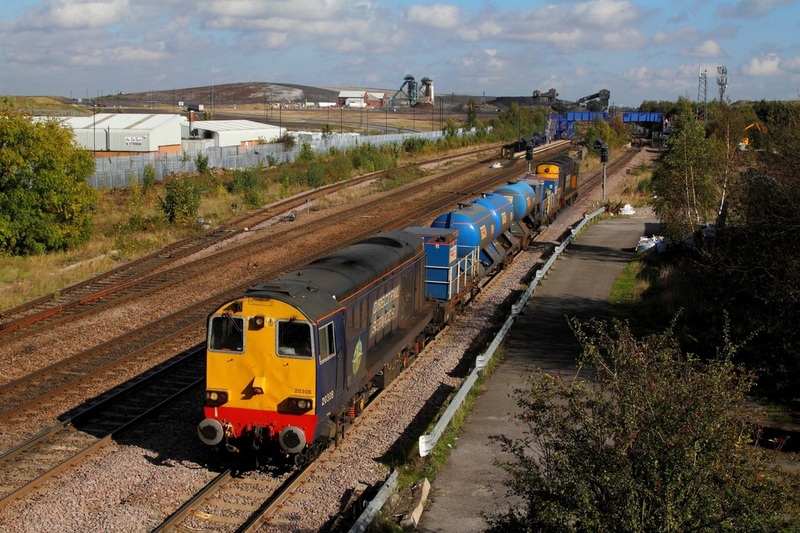 37406/410/416/417/426/427 have all been sent to CF Booths Rotherham for scrapping. 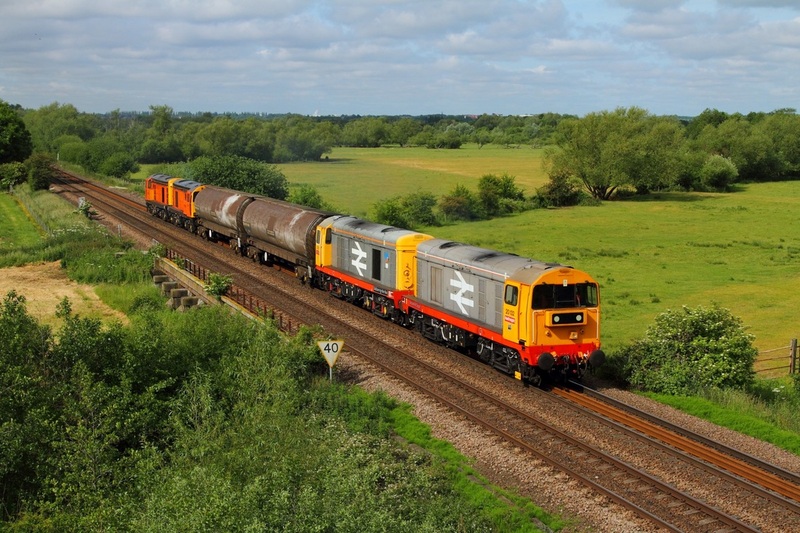 Click here to view more photographs of the Class '20s' working the RHTT Duties throughout 2011, including 20142, 20189, 20901, 20905 and 20096. 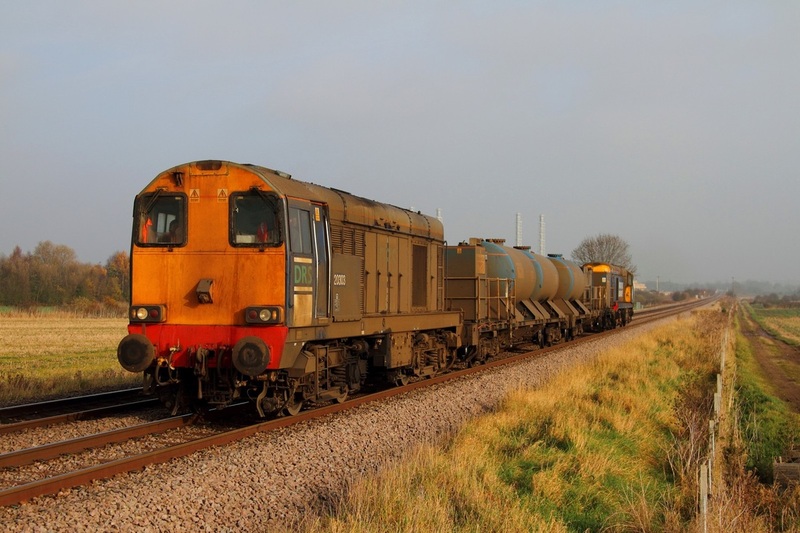 On the 16th November 2012, the South Yorkshire RHTT opted to spray the Brigg line as far as Northorpe instead of visiting Grimsby as usual on a Friday. DRS old liveried 20303 leads 20301 on the 3S13 Wrenthorpe to Wrawby junction via Northorpe, heading south at Scawby which is just south of Brigg. The RHTT train containing sandite, would reverse at Northorpe before returning to Wrawby junction. flasks (no. 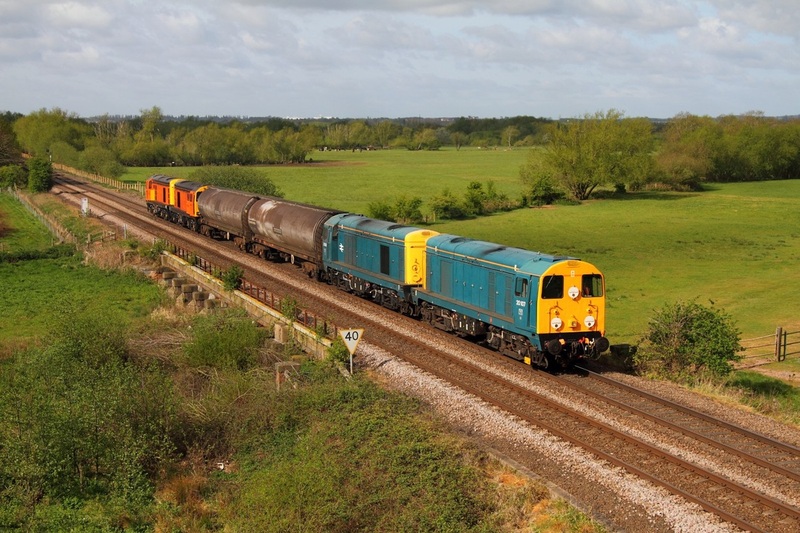 FNA 550033, FNA 550052 and FNA 550023). 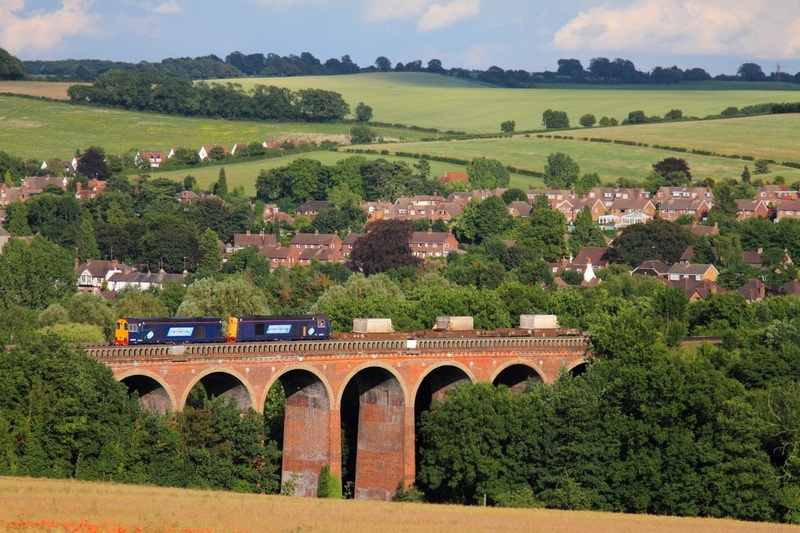 The Choppers are photographed crossing Eynsford viaduct. 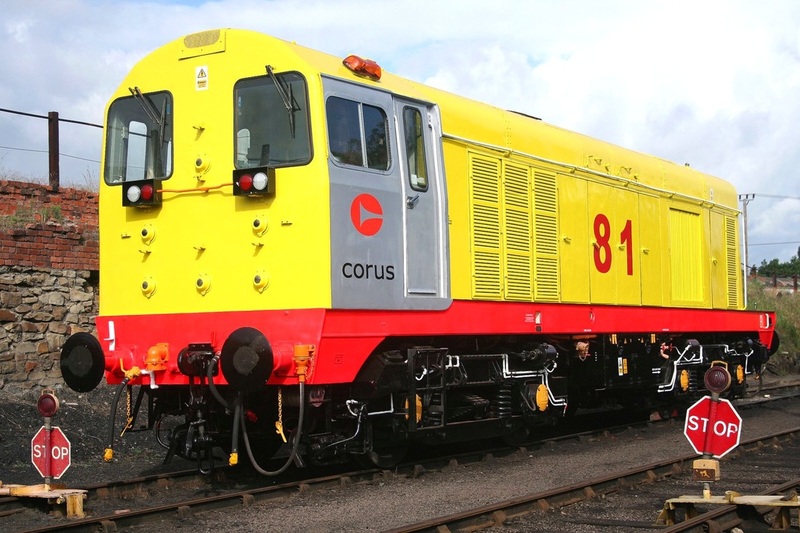 On the 8th July 2006, recently after being outshopped in Corus livery, 20056 is photographed on static display at a Barrow Hill open day event. Looking rather bizarre in French orange livery, Traditional Traction's CFD no. 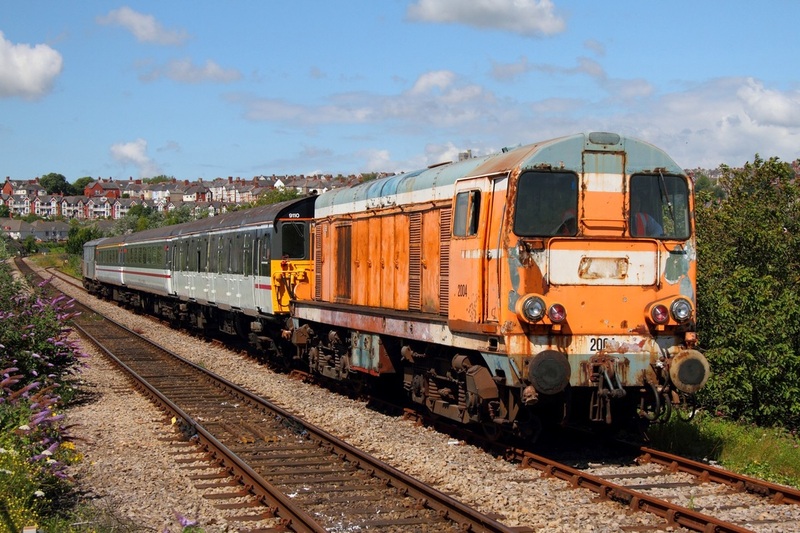 2004 (20228 - the last class '20' built) leads three ex-Gatwick Express coaches and 73118 to Barry Island to form the 11:45 Barry Island to Waterfront. 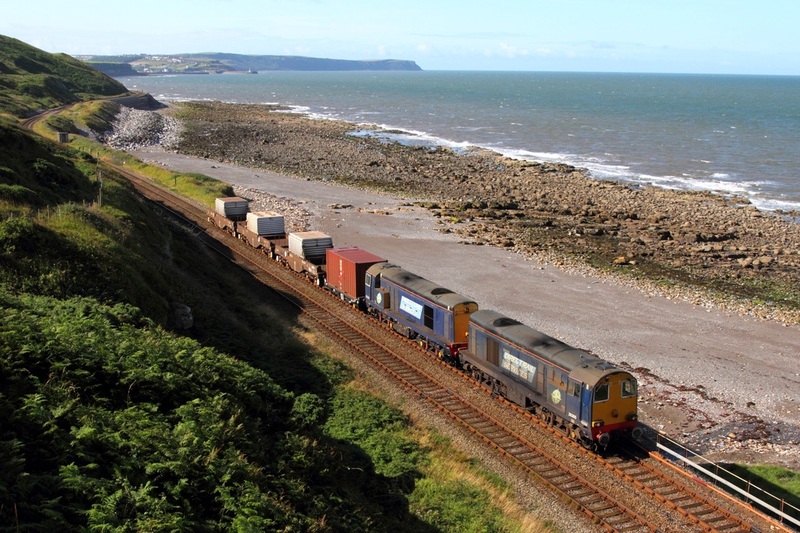 The train is captured at the Causeway on the approach to Barry Island on the 28th July 2012. 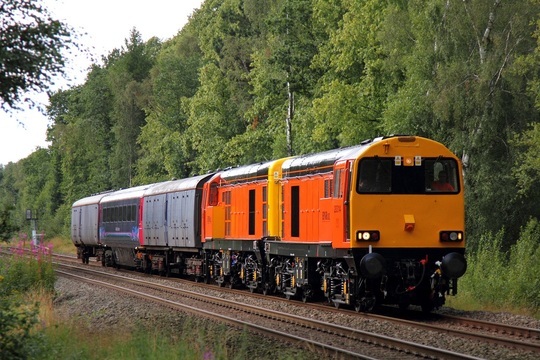 Sporting the latest Harry Needle Orange livery, 20314 leads 20311 at Streetly near Sutton Coldfield whilst hauling the 5Z20 Kilmarnock to Laira, Plymouth as far as Washwood Heath on the 22nd August 2012. 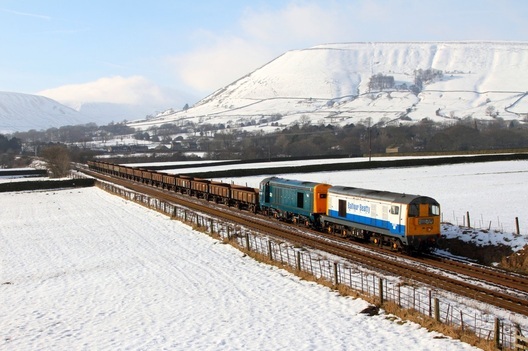 The consist was barrier vehicles 6348 and 6330 with newly refurbished and converted from a buffet car 42513. The Choppers would be replaced by 31601 and 31602 at Washwood Heath and would work the train forward to South Devon.